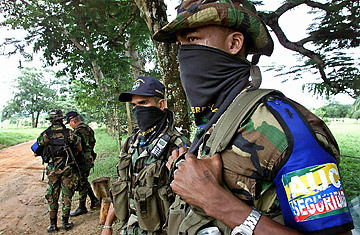 Members of the right-wing paramilitary group United Self Defense Forces of Colombia (AUC), photographed in 2004. Colombia's President Alvaro Uribe headed to Washington this week, hoping to contain the fallout from an ever-widening scandal linking some of his closest allies to right-wing paramilitaries  a scandal that is threatening a key free-trade agreeement and future military aid from the U.S. The trip puts Uribe under the spotlight of a Democratic-controlled Congress, some of whose legislators have expressed concern over the light sentences awaiting confessed paramilitary leaders under a deal negotiated by the Colombian government. But Washington has made its own deal with at least one backer of the Colombian paramilitaries: Under an agreement with the U.S. Department of Justice in March, banana giant Chiquita Brands International acknowledged it had paid $1.7 million to Colombia's paramilitary groups. The company said it had made the payments to protect its employees, but about half of the money was paid after the paramilitary federation in question, the United Self Defense Forces of Colombia, or AUC, had been placed on Washington's list of foreign terrorist organizations in September of 2001. According to court documents filed in the case, Chiquita executives were aware of the inclusion of the AUC on the the U.S. list of foreign terror organizations, and debated whether they should continue with the payments. The documents show that the company consulted with a lawyer who, in a February 2003 e-mail stated unequivocally: "Bottom line: CANNOT MAKE THE PAYMENT." Still, Chiquita continued to make monthly payments to the AUC until February 2004, even after disclosing the situation to the Justice Department. The Justice Department proposed a settlement under which the company would pay a fine of $25 million  one quarter of the maximum criminal fine that would have applied had the company been found guilty in court. The terms of the deal scandalized human rights activists in Washington and high-level officials in Colombia: "If they had admitted to paying Al-Qaeda, things would be different," said Dan Kovalik, a lawyer with the United Steelworkers Union, which is sponsoring civil suits against a number of U.S. corporations for allegedly hiring Colombian paramilitaries to kill or intimidate union members and officials. "It's like they're saying, well, yes, they're terrorists, but they're our terrorists," Kovalik said. Colombia's chief prosecutor Mario Iguar�n, who met this week in Washington with Attorney General Alberto Gonzalez, has said he might seek the extradition of top Chiquita officials to stand trial here. Uribe himself has said he would like to see those responsible for the Chiquita payments to the AUC face Colombian justice. Extraditions are unlikely, although the Justice Department acknowledges that the investigation into Chiquita's payments to the AUC is ongoing  its focus, a DOJ official indicates, may now be on individual company executives on a list of 10 "relevant persons" identified only by letters of the alphabet in the documents filed by the Department in the U.S. District Court in Washington, D.C.
Chiquita spokesman Michael Mitchell said that the company had felt obliged to make the payments to protect its employees. "We believe they saved people's lives," he said. However, during the time Chiquita was making the payments, thousands of people across Colombia died at the hands of the AUC, which expanded its power. In the banana belt alone between 1997 and 2004, right-wing paramilitaries are blamed for 22 massacres in which 137 people were killed, according to government figures. Human rights campaigners also complain that the U.S. has not aggressively pursued U.S. financiers of the Colombian paramilitary groups on its own list of terrorist organizations. "It wasn't like this was an aggressive investigation," said Kovalik. Chiquita came forward with information about the payments, and the case "sort of fell in the lap of the Justice Department so they had to do something," he said. A Justice Department spokesman declined to say whether there are probes into similar activities by other U.S. firms operating in Colombia. Terry Collingsworth, an attorney with the International Labor Rights Fund, which is supporting civil suits being pursued against Drummond, Nestle and Coca-Cola, says there should be, charging that other U.S. companies in Colombia have broken the same laws that Chiquita admitted violating. Assistant Attorney General Kenneth Wainstein, announcing the Chiquita plea agreement, said: "Corporations are on notice that they cannot make protection payments to terrorists." But the human rights lawyers complain that the message from the Chiquita deal is that if companies do transgress, they'll be let off lightly.